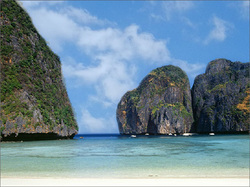 Thailand is an independent country in the heart of Southeast Asia. It is bordered to the north by Myanmar and Laos, to the east by Laos and Cambodia, to the south by the Gulf of Thailand and Malaysia, and to the west by the Andaman Sea and the southern extremity of Myanmar. Its maritime boundaries include Vietnam in the Gulf of Thailand to the southeast and Indonesia and India in the Andaman Sea to the southwest. Thailand's capital and largest city is Bangkok. Thailand is divided into 77 provinces, which are geographically grouped into five regions. The capital Bangkok is not a province but a special administrative area. The celestial world is a close confidant in this Buddhist nation, where religious devotion is a colourful and ubiquitous spectacle. Gleaming temples and golden Buddhas frame both the rural and modern landscape with exuberance. Ancient banyan trees are ceremoniously wrapped in sacred cloth to honour the resident spirits, fortune-bringing shrines decorate humble noodle houses as well as monumental malls, while garland-festooned dashboards ward off traffic accidents. The Thai’s ongoing dialogue with the divine anchors the day-to-day chaos to a solid base of tranquillity. Visitors can join in on the conversation through meditation retreats in Chiang Mai, noisy religious festivals in northeastern Thailand, peaceful underground cave shrines in Kanchanaburi and Phetchaburi or scenic hilltop temples in northern Thailand. No matter what draws you to the country first, a Thai meal will keep you hooked. Adored around the world, Thai cuisine expresses fundamental aspects of Thai culture: it is generous and warm, outgoing and nuanced, refreshing and relaxed. And it is much more delicious in its native setting. Each Thai dish relies on fresh and local ingredients – from pungent lemongrass and searing chillies to plump seafood and crispy fried chicken. With a tropical abundance, a varied national menu is built around the four fundamental flavours: spicy, sweet, salty and sour. And then there are the regional differences, which propel travellers on an eating tour of Bangkok noodle shacks, seafood pavilions in Phuket, Burmese market stalls in Mae Hong Son, and luscious tropical fruit everywhere. Cooking classes reveal the simplicity behind the seemingly complicated dishes and mastering the markets becomes an important skill.